Socialists, Communists, Marxists and other liberty hating ideologues were out in full force at Lawrence’s Bread and Roses festival again this year. It is a festival rooted in celebrating the formation of unions in Lawrence and is usually hijacked by political groups with very unrealistic ideas. This is a real conversation with socialists who actually had a table at the Bread and Roses festival on Labor Day. The couple I met at the socialists table told me that capitalism and money were “evil”. “The goal of all good people is to do away with money and fight for equality,” the woman told me. Notice you are “good” if you have their approved ideas. Really? So how do we survive without money? “In Cuba there is only poverty because of America. Our boycott is starving the people of Cuba,” she answered. I looked thoughtful and asked her about the lack of free speech in Cuba and the journalists who are now serving long prison terms for speaking out against Castro. “America is no better. We imprison people for their beliefs all the time, you just don’t hear about it,” she said. Resisting the urge to ask her which planet she was living on, I continued with my feigned receptiveness and continued to ask questions. It was fascinating. “So, it’s wrong if we do that?” I asked. “Of course it is!” She seemed indignant. She wasn’t even hearing me she just launched into a five minute speech on how horribly oppressive America is and how we have no free speech in this country. Mind you, all the while she is telling me this she is in a public place, out in the open, with a table of anti American and anti-capitalist literature, blaming America for every problem in the world. For the record, we do not imprison journalists for their beliefs. But I was not there to argue I was there to learn … and amuse myself. “Those journalists are traitors,” she snapped. “Traitors, who have sold out their country by working with the US government to overthrow the country. We do the same thing,” she repeated. So, it’s OK for Cuba to do it but not OK for America? One thing I learned about discussions with liberals and leftists is that they are quick to make an accusation but devoid of specific details when pressed. That’s why it is important to ask lots of questions when talking to liberals and socialists, usually one in the same. “What about Guantanamo? What about the political prisoners?” … she shot back, as if this was an answer. The prisoners at Guantanamo are Al Queda and Taliban terrorists captured on the battlefield. Not ready to let her change the subject by answering her, I pressed on with more questions. She seemed insulted by my questions, but I was only there to learn. “What about Mumia?” she asked clearly getting flustered. Mumia happens to be an admitted enemy of the United States and is in prison for killing police officers. “He is in prison for his beliefs!” she charged. More proof that to have a leftist view of the world is to live in denial of reality. Rather than argue I just kept asking questions. Clearly she had to have some specifics if she was so convinced this was true. Instead, she wanted to talk about how racist and evil America is for “waging war against Muslims.” …another topic unrelated to my question. Apparently, she hadn’t read anything about the war in Bosnia where the U.S. rescued millions of Muslims from extermination, or the Muslims we freed in Kuwait. “Why do you suppose America hates Muslims and what makes you think this is true?” I asked. She didn’t even hear me she just kept blabbering. “You can’t trust the media,” her husband broke in. “You have to get the real news … from our publications,” she added, pointing to her table filled with books on the glory of Marx and Castro, as well as the evils of America. “So, for socialism to work,” I probed, “we need to get rid of money and have the government make us all financially equal by taking away our liberty?” I asked, seeking clarification as to why money, capitalism and personal liberty were bad things. “If you have something that has value and someone else doesn’t you are not equal,” she said. Astonished by this, I asked her if minorities (by definition) should have the will of the majority forced upon them. It seems as though this flies in the face of everything leftists and socialists say they stand for. “Oh,” I responded. “Well, thanks for your time, I would like to educate myself more about this socialism thing. These books on socialism and Marxism, can I take these home? Are they free? I want to read more,” I said continuing the facade. Socialists value forced equality over individual liberty and do so on the premise that you must practice what they preach. All the while they profit from capitalism and benefit from freedom by spreading their anti-American message in a country that allows (values) their right of free speech to peddle such hate. Try doing that in Iran, China, Saudi Arabia, or even Cuba … or 3/4 of the rest of the world. Another valuable lesson learned right here in Lawrence, thanks to the freedoms of our capitalist system and the love of liberty our nation was founded upon … not equality as Marx and the American socialists would have you believe. Can’t believe there are still people who believe in this stuff, would’ve loved to hear what she thought about Stalin and his gulag! Anyway, regarding the “universal” leftist, my own conclusion is that there’s a few politically organized leftists who see it as an oportunity to impose a Communist dictatorship where they will rule in riches, and the communist masses/followers who are either naive benevolent people or lazy oportunists. 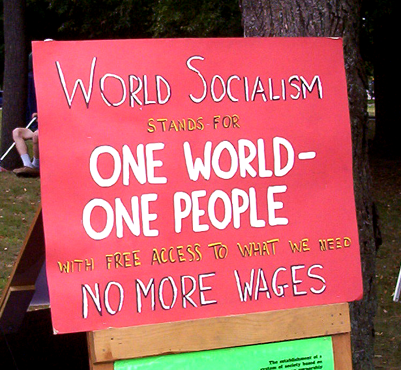 As original ideologies/systems, both Communism and Socialism are bound to fail almost by definition.